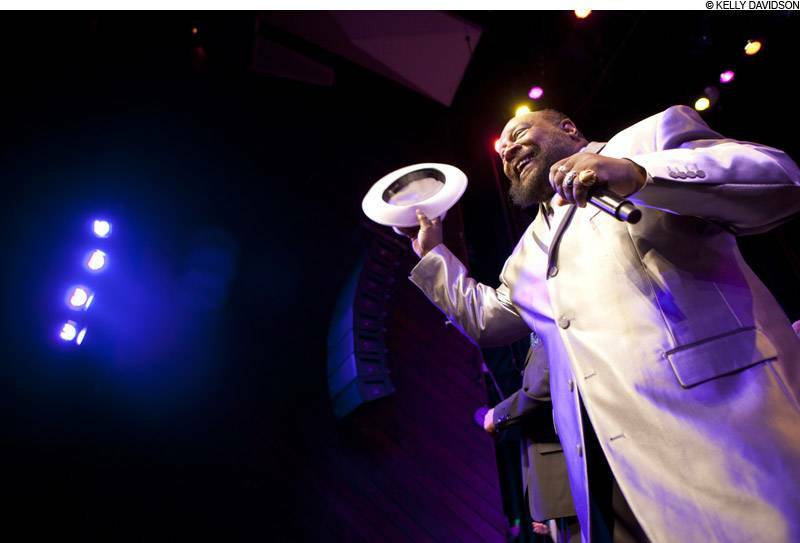 George Clinton and the P-Funk All-Star’s concerts at Crossroads KC have become a rite of spring. The troupe has performed there almost every year since the venue opened. It was clear from the first song, however, that something was different at Friday night’s concert. Clad in a white suite and hat and shorn of his trademark rainbow dreadlocks, Clinton was dressed for business. While he was content in the past to shuffle in and out of his stable of nearly two dozen musicians, this time he claimed the stage on the first number and left no doubt who was in charge.Performing without longtime foil Gary “Diaper Man” Shider, who succumbed to cancer in 2010, Clinton sang with an urgency and intensity. As if reestablishing his legacy, Clinton pulled the first two songs of the night from the first two Funkadelic albums, both released in 1970. The lyrics to the second number, “I Wanna Know If It’s Good To You” set the tone: “Look out, here I come/right back where I started from.” Later in the night Clinton dug unearthed “The Goose That Laid the Golden Egg,” which dated to his pre-funk doo-wop days in the Parliaments in the late 1960s. Time has not been kind to Clinton’s voice. The musical pioneer’s raspy growl resembled Tom Waits doing James Brown, but it didn’t keep the 70-year-old from commanding the stage, jumping, shouting, directing and passing the mic to his son, granddaughter and grandson. During extended solos he took a seat by the drum kit, surveying the scene and snapping his fingers. It took nearly 30 minutes before Clinton dropped the first big hit of the evening. A lengthy reading of “Flash Light” went straight into an equally extensive performance of “Freak of the Week,” best known today as the basis for De La Soul’s hit “Me, Myself and I.” Following “Freak,” Clinton turned the stage over to guitarist Michael Hampton for “Maggot Brain,” the “Free Brid” of funk solos.The All-Stars’ nearly annual appearances at Crossroads may have saturated the market. Despite perfect weather, the venue was only half full to start the weekend. The crowd was a diverse mix of races and ages, ranging from under-21 fans possibly seeing Clinton for the first time to longtime listeners who grew up on P-Funk. The loose arrangements allowed plenty of room for improvisation, solos and sidetracks. “Freak” featured a detour into the standard “Sentimental Journey” while Clinton’s son and grandchildren each got a chance to showcase their rapping skills. At one point Clinton led the band into a bit of “Bustin’ Loose” in tribute to the recently deceased Godfather of Go-Go, Chuck Brown. Sometimes the arrangements were too free, though. Despite starting strong, the music meandered in the second half, particularly during “Up for the Downstroke” and “Aqua Boogie.” Just when the band seemed headed off the cliff, however, they caught second wind at the two-hour mark. “Give Up the Funk (Tear the Roof Off the Sucker)” seemed to invigorate both the crowd and musicians. A fun romp through “Atomic Dog” found many women from the crowd invited onstage to dance with the band and ended the night.